The TIE Advanced x1 featured an original spaceframe and reinforced durasteel-alloy hull, with an elongated rear deck and matching bent wings covered with solar-panels. The vessel had a solar ionization reactor and paired twin-ion engines for a more powerful drive system than the standard TIE Fighter. Speed was only slightly improved due to the added mass of the vessel; a good deal of the extra power was bled off to the shield generators. While less maneuverable than standard TIE fighers, it could take a beating. The TIE Advanced x1 had twin heavy blaster cannons in a fixed, front-mounted position. In addition to its shields, it had a modest hyperdrive but no life support systems. The Empire decided not to order the TIE Advanced x1 in large quantities, citing their excessive cost. Privately, some Imperial Navy strategists admitted that the Navy was afraid to purchase a fighter with a hyperdrive, fearing that it would give bureaucrats an excuse to slash orders for new capital starships. The few ships built were carried aboard Star Destroyers. Restricted deployment. 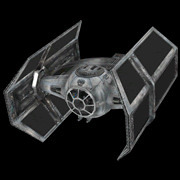 This was the most advanced TIE fighter available before the New Republic era and the advent of the TIE Defender, Avenger and Phantoms.